At this point, unfortunately, charges based on texting while driving are not especially newsworthy. Charges based on texting while driving while also talking on a second phone at the same time while driving a tow truck are a different story, however. The incident of which the end result is pictured above happened on July 30 in Buffalo. A 25-year-old gentleman admitted he had been juggling two cell phones behind the wheel when he hit another car, left the road, sideswiped this house, and ended up in the pool. 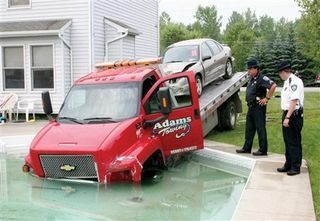 Because he was towing a car on his flatbed at the time, he managed to damage three vehicles and a house and require a pool cleaning all in the same accident. Luckily, no one was seriously injured. The sheriff in the dark uniform, who you may remember from such films as "Smokey and the Bandit II" and "Cannonball Run," likely delivered a quip such as "Who's the U-boat commander?" only to be reminded by his deputy that it was a line from "Risky Business." He then removed his hat and swatted the deputy with it. What’s the Point of Being a Polo Tycoon If You Can’t Adopt Your Girlfriend?